Etymology: the name " escallonia " comes from the Spanish Escallon who discovered the first species. Origin: Andes Cordillera, in Chile. Introduced in the middle of the XIXth century. Many hybrids were created which are more resistant to the cold, but less tolerant in the limestone. Habitat: the escallonia appreciates a position of full light. It supports well strong winds and spray and develops well in the west of France. A not too calcareous soil is suitable for it, soil which can be corrected by contribution of peaty soil. Hardiness: zone 8 (-12°C or 10°F). Height: 2 - 4 m according to the cultivar. Shape: globose crown or upright (it is case of the escallonia rubra). Bark: exfoliating bark as it matures. Persistent foliage. Leaves glossy green. Tubular flowers from May till July or September according to variety or cultivar. In colour pink or red crimson according to the cultivar. Flowers are fragrant and nectariferous and attract the butterflies. Use: the Redclaws shines brightly insulated or in hedge among other shrubs with flowers. 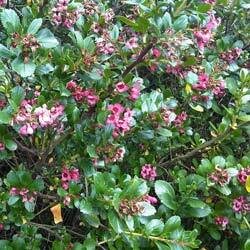 Advices of maintenance: the escallonia supports pruning after blossoming, or at the end of winter. Escallonia exoniensis or Redclaws of Exeter, rather hardy hybrid of 1891, tree nurseries Veitch (Langley, England), coming from a crossing between Escallonia pterocladon and Escallonia exoniensis ' Frades'. Escallonia fradesii ' Pink Princess ', coming from a crossing between Escallonia rosea and Escallonia rubra with pink blossoming supported, flared form. Escallonia Ingrami or Ingram's Redclaws, hybrid created in 1894 by the English captain C. Ingram (Kent) by crossing of Escallonia rubra macrantha and Escallonia punctata : rounded form, aromatic foliage, evergreen, blossoming in summer (June-August) in pinkish red. Escallonia Iveyi, English hybrid coming from crossing between Escallonia bifida and the hybrid Escallonia x ingramii : rounded form, foliage persistent in wavy margin, white blossoming in the middle of the summer (July-August). Escallonia langleyensis Veitch., hybrid of nursery gardens Veitch (1893), coming from a crossing between Escallonia punctata and Escallonia virgata : flare form, semi-persistent foliage (according to climate), blossoming at the end of spring or the beginning of summer (June-July), in red turning to carmine. Escallonia langleyensis "'Apple Blossom": form shrub, small pruning 1,50 in 1,80m, foliage broad dark green, bright at the beginning of the summer, blossoming white pinkish. Escallonia rubra ' Crimson Spire ' in upright form, blossoming of crimson red.